When you are applying for a job, the first thing the hiring manager sees is your cover letter, even before they take a look at your resume. To make sure they want to see that next page, you need to compose a cover letter that gets their attention and highlights a few relevant skills and experiences. Your cover letter shouldn’t reiterate what is on your resume, but rather, call attention to a few details that make you perfect for the position. Here's an example of a cover letter for a hair stylist position. This is a cover letter example for a hair stylist position. Download the cover letter template (compatible with Google Docs and Word Online) or see below for more examples. I would like to express my strong interest in your hair stylist position at Shear Hair Salon. With years of experience as a hair stylist and colorist for a wide client base, I know my skill and versatility would make me an asset to your salon. I have over five years of experience working as a hair stylist for a variety of people and hair types. I graduated from the ABC School of Hair Design and Cosmetology, where I gained over 1,000 hours of experience styling, coloring, and treating hair. I subsequently worked for four years at La Flor Hair Salon, where I honed my skills and also learned new treatments, including balayage and keratin treatments. My clients recommend me to others for my skill and versatility. You state in your job posting that you want a hair stylist who can also work part-time at the reception desk. Having worked as a receptionist for a spa and a hair salon, I am very comfortable communicating with clients both on the phone and in person. Both clients and employers have praised my strong communication skills, and I am confident I can bring those skills to a position at your salon. I have attached my resume and the two requested recommendations for your review. I will call your office next week to arrange a time to speak in person about my qualifications. Thank you for considering my application. This resume example for a hair stylist includes sections on education, related experience, and other experience. 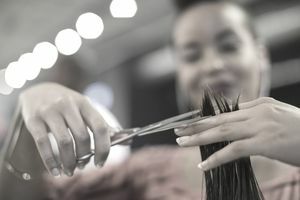 Because this applicant has limited work experience as a hair stylist, she includes jobs in which she developed related skills, including jobs in administrative and secretarial work. If you do not have much experience in the industry in which you are applying for a job, include experiences (paid work, volunteer work, and internships) in which you developed skills that are applicable to the industry. Download the hair stylist resume template (compatible with Google Docs and Word Online) or see below for more examples.